Ft. Eustis “Felker” KFAF US ARMY Airfield is a super-detailed airfield dedicated to all the service men and woman. KFAF is located in Virginia bordering the James River, in close proximity of the picturesque Chesapeake Bay. The James River also host the Ghost Fleet. Oh yes, I also rendered the fleet in 3D. 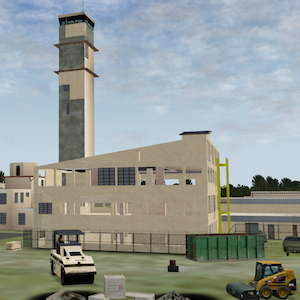 The airport is under renovation and the scaffolding, construction equipment has been modeled. This is NOT a “Lego” block approach. Every building was carefully reproduced in 3D, I even did not forget the smokers gazebos, containers and trash-bins. ALL equipment, buildings, vehicles, grasses, forests, etc. have been modeled by myself “except” military vehicles and the chinooks. Those are from David Austin, Michael Hoge and the Privateer. These excellent objects are located in a folder, named “/NotMine”. Thank you for this.